Agfa Graphics announced today the worldwide availability of its new chemistry-free direct-on-press Azura TE plate. With a direct-on-press workflow, time to press is considerably shorter and the waste is drastically reduced. As the Azura TE plates are cleaned out on-press, the system requires no processor, no chemistry and no water. This entails lower energy consumption and less maintenance, thus resulting in environment-friendly operations as well as cost reductions. Azura TE, however, does not sacrifice on image quality and pressroom working conditions. Mounted on the press, Azura TE behaves very similarly to a traditionally processed or chemistry-free plate, limiting the variables in press room operations. The plates clean out rapidly and ink acceptance is immediate, both resulting in sellable sheets after only a few copies. 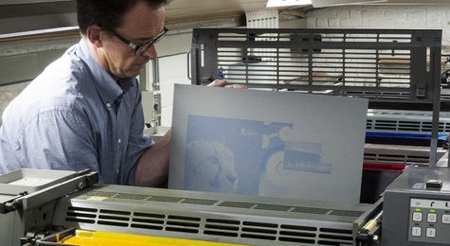 "In fact a ‘direct-on-press’ plate is ready for use after exposing on the platesetter", said Guy Desmet, Head of Prepress Marketing, Agfa Graphics. "On top, Azura TE shows an outstanding image contrast thanks to our patented Thermochromic Dye technology. That makes visual inspection easy and means that dot measurements or plate detection can be done with standard devices. In addition, Azura TE has an excellent daylight stability, which comes in handy if the plates cannot be mounted on the press immediately." Characteristic of Agfa Graphics' Azura chemistry-free and direct-on-press plates is the excellent lithographic behavior on press, supporting up to 240 lines per inch with Sublima screening. They also stand out thanks to their printing stability resulting from the elimination of the many variables inherent to a conventionally processed plated. Guy Desmet added: "A one year field test period all over the globe taught us that Azura TE is compatible with all Agfa and non-Agfa platesetters, a wide range of founts, inks and press architectures. Customers love the ease of use of Azura TE, the gain in system productivity and the quality on press." Since its launch in 2004, Agfa Graphics’ ThermoFuseTM technology has proved itself as the leading technology in sustainable platemaking. Azura TE is based on the same ThermoFuseTM technology as its predecessors, working with a single-layer water-based coating, containing ink-accepting latex pearls, small enough to deliver razor-sharp highlight reproduction.